Alex Christensen of Global Risk Insights offers a warning to global investors dealing with the global turmoil and U.S. stock markets. Developments in Ukraine and the Middle East can prove harmful to the U.S. stock market. With the unfortunate Malaysian Airlines crash being a result of actions of Russian-tied rebel factions, there is increased pressure on the European Union to impose economic sanctions on Russia. Even though the U.S. will likely press for crippling actions on the Kremlin, Europe had a lower appetite for this move because their economic prosperity is tied to access to plentiful Russian energy sources. Now with this distasteful event, Europe will face more outward pressure to respond to their neighboring menace even if it contributes to a recession for them. Then there are rising tensions in the Middle East where ISIS are gaining ground in Syria and Iraq, while Israel is expanding operations in rooting out Hamas in Gaza. This is also spooking global investors that are concerned about about free flowing oil. If access to oil is compromised by these developments, then that can dampen economic growth because businesses and consumers rely on crude oil to keep their energy prices low. If crude oil becomes scarce, then that will drive up the cost of gasoline and causes both consumers and businesses to downsize. Global investors are aware of the risks associated with Eastern Europe and the Middle East and have sent their funds to safe U.S. Treasury securities. Even though Standard and Poor’s have reaffirmed the U.S. credit rating at AA+ due to high budget deficits and Congressional gridlock, they still remain a safe haven for investors seeking safety. When investors start buying bonds, this drives down their yields and thus bring down other interest rates associated with it, such as the prime interest rate and the mortgage rate. With interest rates remaining low, there is enhanced risk of asset bubbles. As implied by Christensen, the Fed has been trying to normalize interest rates, which have been artificially lowered by Fed policy aimed at boosting employment. Even though the Fed actions have undoubtedly improved labor markets with U.S. unemployment rate on the decline, it has roiled foreign markets, who are struggling to tamp down inflation and prevent asset bubbles themselves. Eventually, these same symptoms could be felt in the U.S., especially if signs of a more robust recovery becomes more consistent. Stronger labor markets will provide U.S. consumers with more security and income, thus resulting in more savings. If U.S. consumers decide to shift their increased savings to the U.S. stock market, then there is concerned that this could push equity prices to unsustainable levels and cause a market crash. All of these events can compromise Fed policy and end up swallowing wealth in the long-run. The U.S. Bureau of Economic Analysis provided yet another revision to their first quarter numbers. In a third revision, we now learned that the economy declined by 2.9 percent, as measured by real gross domestic product (real GDP). That would rate as the second sharpest decline during the Obama administration and that worse decline was when we were in the midst of a steep financial crisis in the first quarter of 2009 when the economy contracted by 5.4 percent. Even though that is a depressing rate, many analysts still believe that it will be a temporary bump. Weather was particularly bad across the U.S., so we should see a healthy rebound during second quarter. Job growth remains healthy with June private sector job growth estimated at 281,000, which would be the highest since November 2012. Take a deep breath and take comfort that the U.S. economy should rebound strong in the 2nd quarter. Having said that, our economic recovery remains relatively soft with the International Monetary Fund downgrading U.S. economic growth prospects for 2014 from 2.8 percent to 2 percent. Andrew Beaujon of Poyntor Institute wrote an interesting report describing how the Associated Press (AP) is planning to use robots to write certain business stories. My first inclination was thinking about how this would negatively impact the journalism industry by reducing the number of media reporters. While that still might occur even though AP has said this would not impact any current jobs, it hints at what skills and value a potential journalist or any worker for that matter will need to prosper in this new environment. First, Automated Insights will be providing the automation technology through the use of Zacks Investment Research. Its content will consist of writing various earnings reports of companies. Through this form of innovation, the capacity of company data reports will rise exponentially. Whereas currently 300 stories are generated manually each quarter, that figure will jump to 4,400 stories. This mundane tasks of writing earnings reports will free media journalists to focus more stories on business strategies and personal relationships with key industry leaders, along with adeptly identifying future industry trends. Therefore, journalists with strong critical thinking and investigative skills will be in greater demand with the labor-intensive grunt work diminishing. With amazing technology and innovation, there is so much data available out there. To the undiscerning eye, that might mean that it will be easier to generate stories and research, but actually it will be more difficult. With so much information, both good and bad, the value will be found in those individuals that can sift through pertinent, accurate information and communicate it in clear and concise ways to their audience. Contemplate that for a moment. 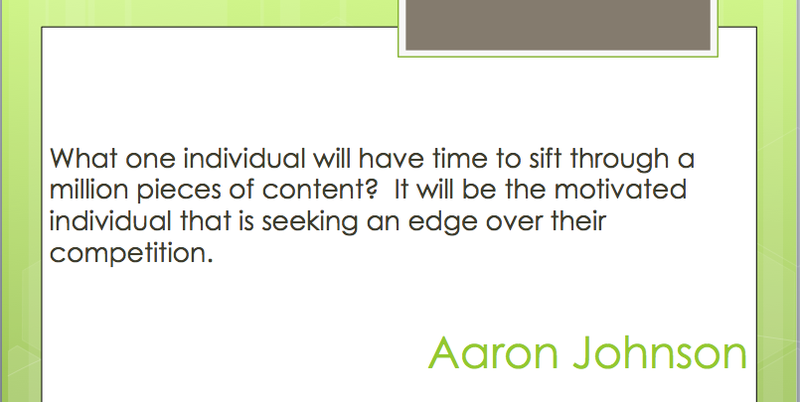 What one individual will have time to sift through a million pieces of content? It will be the motivated individual that is seeking an edge over their competition. While that is obvious hyperbole, the greater meaning is who can seek and acquire relevant information in an efficient way. Individuals that are very proficient at that skill will see their market value rise. As you enter the new marketplace, recognize that we are in Informational Revolution and adjust accordingly. All-In Nation: Are You In or Out? 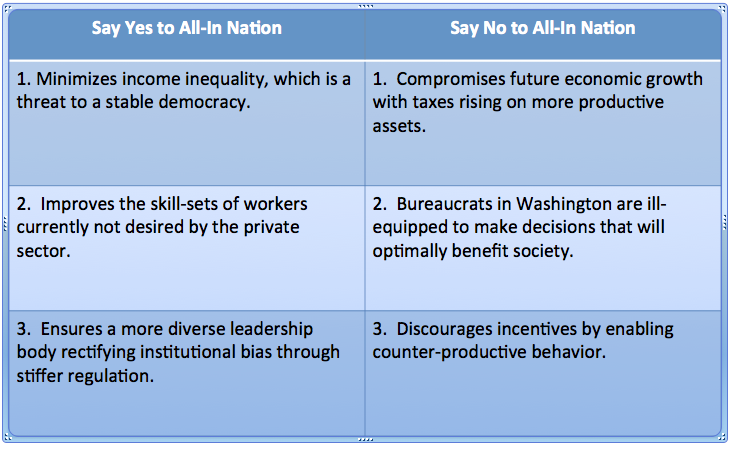 All-In Nation is a collaboration between the Center for American Progress and PolicyLink and it is centered on exploring ways to create broad-based economic growth. Their progressive agenda is to lower income inequality by ensuring that barriers and obstacles are eradicated through encouraging more public investment and breaking down employment discrimination through stricter regulation. Minimizes income inequality, which is a threat to a stable democracy. Improves the skill-sets of workers currently not desired by the private sector. Ensures a more diverse leadership body by rectifying institutional bias through stiffer regulation. Minimizes income inequality, which is a threat to a stable democracy. Since 1980, there has been a steady erosion of the middle class as an emphasis on technology has transformed our workforce. It was also during that time that we saw a drastic reform within our tax code where marginal income tax rates were substantially slashed at the very top from 70% in 1980 to a low of 28% in 1988. While that encourages more investment and higher economic growth, the downside is that it could enrich few and impoverish many. This result has given rise to grassroots movements, such as Occupy Wall Street, that are demanding that wealth be redistributed to the masses. If this goes unaddressed, the basic fundamentals of capitalism could be threatened. Improves the skill-sets of workers currently not desired by the private sector. Businesses are committed to maximizing profits and that implies a lesser commitment to investing in individuals with less marketable skills. In those instances, the public sector can fill those gaps through workforce development investments. That could entail more funding to various local Department of Labor locations or grants to local colleges and universities. There are also opportunities where there can be greater collaboration between the public sector and private sector, so that market forces are more aligned. Ensures a more diverse leadership body by rectifying institutional bias through stiffer regulation. It is human nature to have conscious or subconscious biases when it comes to hiring staff. They can occur through distorted images from media or limited interactions with people of different cultures. When making key hiring decisions, it is often more convenient to rely on an insulated network that is not as diverse. With both instances, we see a management structure might not be attuned to their market and ignore highly talented prospects. This can be rectified through affirmative action or other legislative acts that force management to broaden their job search scope. Compromises future economic growth with taxes rising on more productive assets. Bureaucrats in Washington are ill-equipped to make decisions that will optimally benefit society. Discourages incentives by enabling counter-productive behavior. Compromises future economic growth with taxes rising on more productive assets. The U.S. has accumulated successively higher budget deficits because their spending has outpaced revenues collected. Making investments in infrastructure that cannot be supported with current fiscal conditions will likely worsen future economic prospects. While the U.S. has been fortunate to finance deficit spending without a huge increase in interest rates, this is not a sustainable strategy in the long-term. Rising interest rates will undoubtedly occur in the future and that will hamper both businesses and consumers ability to access cheap credit. Bureaucrats in Washington are ill-equipped to make decisions that will optimally benefit society. The danger in placing more control with government is that they are either incapable of adjusting to dynamic market conditions or are more interested in fulfilling their selfish pursuits over more valued needs of society. While the free market system allows market forces to veer to projects that will yield the highest economic benefit to society, yielding control over to bureaucrats might result in funding initiatives where political connections trump overall economic benefits. Discourages incentives by enabling counter-productive behavior. In an attempt to reduce inequality, many anti-poverty programs are designed to provide financial and food support. Even though this is certainly helpful in the short-run for families falling on tough times, there are inadequate mechanisms in place to encourage people to wean off public support. In fact, there are instances where people opt to stay on public support, even when work is available because they find it more financially beneficial. While that might be helpful in the short-run, their future job marketability is compromised when the length of unemployment continues to rise. Prolonged periods of unemployment end up hurting them more in the future and creates a poverty cycle that is hard to reverse. On Friday, July 19th, 2013, Governor Rick Snyder authorized the Chapter 9 bankruptcy requested by Emergency Manager Kevyn Orr for the city of Detroit. Specifically, the city was unable to make a scheduled payment of $39.7 million for pensions and sought federal court protection in a bankruptcy proceeding. While a combination of urban flight, auto industry restructuring, and government mismanagement all played a role in the steady decay of the Motown City, the eventual ruling from federal bankruptcy court may have significant ramifications throughout the U.S.
A Chapter 9 bankruptcy allows municipalities to receive protection from creditors as they seek to renegotiate more favorable debt repayment terms. Detroit city officials are hoping that a federal court judge will grant a favorable ruling that extracts major concessions from bondholders, creditors, unions, and retirees. On the other hand, creditors and bondholders are holding out hope that the bankruptcy proceedings will result in declines in compensation and benefits for city employees and retirees, so that will free up more money to pay back their investments and loans extended to the city. Scenario 1: Force bondholders and creditors to take a significant loss on their bond investments which will help facilitate the city’s efforts to reorganize their finances to fulfill agreements with unions and retirees. Scenario 2: Invalidate union and pension agreements and impose significant cuts to beneficiaries, so that can free up finances to pay back bondholders and creditors. In all probability, neither scenario is likely and there will probably be some hybrid of both. While Scenario 1 would be celebrated by union and retirees, this would be the worst case scenario for the financial community. There is obvious appeal with this option because those most vulnerable to the financial crisis, blue-collar workers and retirees, would not see their standard of living impacted. Even though highly-compensated bankers and investors would be subjected to severe losses, they have abundant resources to withstand it. Though populists would love this result, there are potential long-range consequences that would be hurtful to the overall economy. An unfavorable ruling to creditors will likely result in a credit crunch for cash-poor municipalities. There is already a premium that municipalities faced when seeking funds to cover budget shortfalls. That will only be exacerbated if the federal judge rules harshly against the creditors, who will be less enthusiastic about extending credit to poor municipalities without demanding even higher premiums. It could also emboldened local officials to continue making irresponsible spending choices and not face harsh outcomes because they can go to a federal district judge to wipe away their debts. Choosing Scenario 2 also carries significant political risks. While bond investors would be overjoyed with this ruling, that will only embolden political activists to express their rage over the immoral, greedy actions of bankers. Imagine the sympathy generated by showing retirees, who have limited means to recoup losses that were previously promised to them, struggling to make ends meet as health care cost rise and bills mount. Contrast that image with the smug image of a well-groomed executive in a Jaguar and plush mansion. That would be a public relations disaster for the financial community and will only increase calls for greater financial reform where more stringent regulations could hamstring corporate profits and restrict compensation levels. Another problem with Scenario 2 is that it creates a moral hazard where taking on irresponsible risk is rewarded. The declining fiscal finances have been well-documented over the last decade. City of Detroit public officials have been convicted or indicted on charges of embezzlement and financial mismanagement. Bondholders were already rewarded with higher than market returns because the default risk at Detroit is higher than most cities. With that higher return, there is more risk. Therefore, they should accept huge losses in this case and allow markets to work. Poor decisions should result in severe consequences, otherwise markets will not function properly. While it pains me to see that collateral damage will be felt by ordinary Americans, we must allow markets to run its course in this case. Pain must be spread to all parties, though the brunt should be felt by the financial community. Any result that overwhelmingly favors one party over another will only lead to more irresponsible actions in the future. Investors must realize that there is no such thing as a risk-free investment. When finances of an underlying bond falter, they must realize the consequences of a poor investment. If that means losing all or a substantial portion of principal, then consider that to be a hard knocks lesson to learn. Let this also be a lesson to citizens that there is huge downside to running large fiscal deficits, so they must hold their public officials accountable. While we expect our government to provide quality service, we must realize that paying these services through more debt and higher taxes are not sustainable. That will only drive wealth out of a community and lead to further decline and decay. While the shade of indebtedness is dimming Detroit, let us ensure a brighter future elsewhere by shining the spotlight on poor investment practices and shoddy fiscal management. You might have noticed a spike in gas prices over the last couple of weeks. 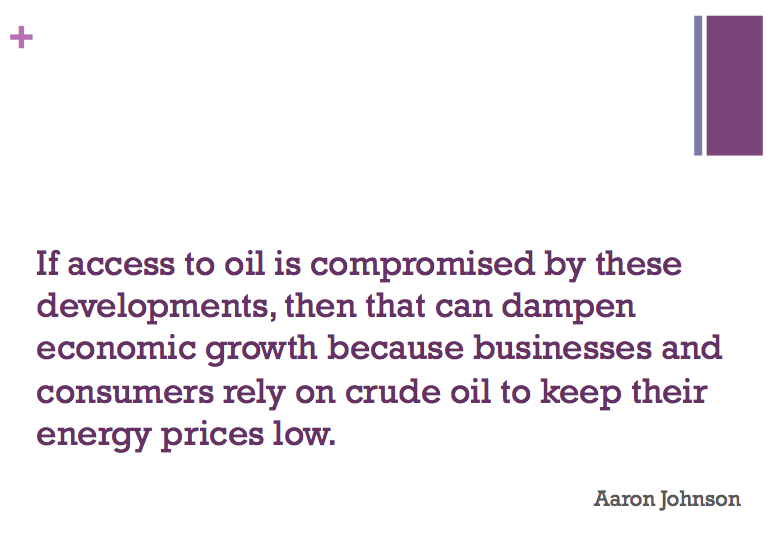 Neil Shah of Wall Street Journal’s Real Time Economics reports that crude oil prices are at a 52-week high. Specifically, crude oil prices have risen to $108.05 a barrel. When looking at the market for gasoline, the price of gas is affected by the market forces of supply and demand. Neil Shah mentions two factors: a rise in crude oil prices and an improving economy. Crude oil prices affects supply, while a stronger economy boosts demand. There are four factors that affect supply. In this case, we want to focus on input prices. Regarding inputs to providing gasoline, think about labor, land, and capital. In this case, crude oil is considered land, which refers to any natural resource. Without crude oil, it is impossible to produce retail gasoline. Crude oil is accessed by refineries, who are then able to convert it into retail gasoline used by cars. There are five factors that impact demand. When Shah stated that greater economic optimism is causing prices to rise, this relates to the first and second factors of demand. When an economy is improving, that means incomes are rising and consumers are more likely to drive and travel because they have more money to spend on shopping. Even though the unemployment rate remain elevated, consumer spending has been trending up. It was a little confusing when Shah referred to a boom in American oil production. That typically results in an increase in supply and drives prices down. However, that would explain previous dips in prices. What is happening now is that the utilization of refineries are near full capacity at 90.7% as of the week ending on June 28. In fact, U.S. refineries are operating at the highest level since 2007. That indicates that driving activity is on the rise and that would place upward movement on prices due to the first factor of demand again. If the utilization of refineries start to fall due to refineries expanding capacity through improved technology, then that would be an example of an increase in supply that would drive prices down due to the second factor. Speculation also plays a role in gas prices and we can look to uncertainty with Egypt. Even though Egypt is not a major source of our gasoline supply, political turmoil there could impact global supply. This scenario would be consistent with the first factor dealing with supply. In this case, prices are driven up not by current market forces of demand and supply, but potential future disruptions in oil supply if the Middle East experiences more political instability. If disruptions are severe enough, then that would drive the price of crude oil up, which is an example of an input price. When wondering why gas prices change, one can often look to the market forces of supply and demand. However, we must also realize the role of market speculation in influencing gas price movements.